Environation Limited is an experienced and professional company providing building services solutions to a diverse range of clients. We provide design, installation, maintenance and repair services to both the domestic and the commercial sectors. Our accredited and qualified multi-discipline engineers, specialising in air conditioning systems, heating systems and domestic and commercial plumbing ensure that our clients are afforded with the highest levels of satisfaction. As a company that is looking to the future of our sector and the evolving requirements of our clients, we are aware of the environmental factors involved in building services engineering. Through the regular training of our workforce and uptake of innovative technologies, we are able to provide greener products therefore reducing both the running costs for the end user and the impact on the environment. 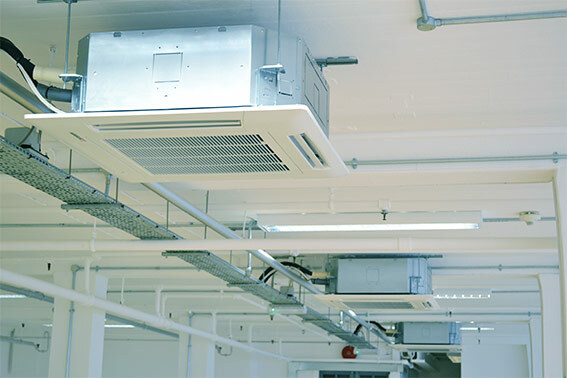 Environation Limited supplies, installs and maintains a wide range of air conditioning technologies, from small single split systems as a heating and cooling source in homes to multi split VRF systems in commercial settings across a range of budgets. We are also invested in training our engineers in the emerging renewable technologies, such as air source systems that can be used as a complete solution in the home, providing heating, cooling and hot water. In adherence to current regulations, Environation Limited and all of our air-conditioning engineers have full and up-to-date F-Gas certification and qualifications. Environation Limited has over 30 years experience in the heating and plumbing sector, and as a result we are able to provide a well-established and thorough installation and maintenance service. We have had experience with heating systems across a wide range of settings, including the complete design and installation of systems and monitoring + controls strategies in both commercial and domestic settings. Environation Limited also caters for any plumbing requirement and provides a complete range of bathroom and kitchen services, from minor repairs to complete installations, throughout a range of classic and contemporary styles. Mark Blackwell, Director - MHR Consultancy Ltd.